Emory celebrates Homecoming Oct. 14-21 with a diverse schedule of activities, events and traditions for both students and alumni. Get ready to board the SS Swoop and set sail as Emory celebrates Homecoming Oct. 14-20 with a “Homecoming At Sea” theme. Homecoming Weekend also coincides with Family Weekend, offering plenty to do for students, families and alumni. Apropos of the theme, the Student Programming Council, which plans student Homecoming activities, kicks off the festivities with a pool party on Sunday, Oct. 14, at the Student Academic and Activity Center at the Clairmont Campus. Get your swimsuit on for some wet fun at 2 p.m.
On Monday, Oct. 15, it’s “All Aboard the S.S. Swoop,” beginning at 6:30 p.m. on the Quad. Come to “Surf Life on Deck” on Tuesday, Oct. 16, at 5 p.m. on Cox Bridge. Wonderful Wednesday on Oct. 17 will take the Homecoming theme; there will also be a Game Night at 6 p.m. on Cox Bridge, plus a Wonderful Wednesday After Dark, details to come. Thursday, Oct. 18, festivities start at 11 a.m. with "Decks, Dealers, and Dooley: Casino Day" sponsored by the Residence Hall Association in conjunction with Homecoming. Then it's HocoFest, a Homecoming festival at Glenn Memorial Church lawn at 5:30 p.m., followed by an 8 p.m. performance at Glenn by comedian Beth Stelling. On Friday Oct. 19, there'll be a 6:30 p.m. at the First-Year Quad and The Homecoming Ball will be at 8 p.m. on Friday, Oct. 19, on the Quad. Rappers Waka Flocka Flame and Ugly God have been announced as the headline performers. 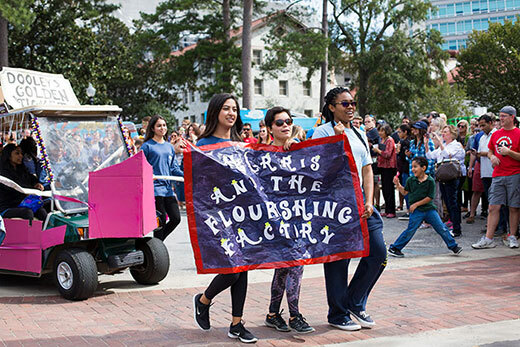 On Saturday, Oct. 20, the Homecoming Parade begins at 1:30 p.m. on the Quad. Then at 2:30 p.m. on the Quad, the Student Programming Council and the Emory Alumni Association present singer-songwriter, Oxford alumna and Decatur native Keri Hilson as the 2018 Homecoming Alumni Concert Headliner. This year, the SPC will hold a raffle for Homecoming Week. Those who come to five Homecoming events during that week will be entered into a raffle to come on stage during the main concert and help SPC throw t-shirts to the crowd. Get a card a various SPC Homecoming events; get the five punches for the events and you will be entered into the raffle. This year, the TechLab at Cox Hall Computing Center celebrates Homecoming with a set of activities to make themed accoutrements. Walk in between 2:30 p.m. and 4: 30 p.m. on Monday, Oct. 15, and learn to make Emory logos for Homecoming, including water bottle stickers, laptop decals and iron-on designs. Make your own memorabilia to display your Emory pride. Come to the TechLab on Tuesday, Oct. 16, between 5:30 p.m. and 7 p.m. to learn how to do some basic soap design with Emory Spirit Soap Making. What says Homecoming like Emory Spirit Pennants? Drop in to the TechLab between 2:30 p.m. and 4:30 p.m. on Wednesday, Oct. 17. Learn how to do some basic sewing with felt and a sewing machine and leave with a custom pennant to show off your Emory spirit. On Mascot Appreciation Day, Thursday, Oct. 18, you can learn how to make Dooley stickers for water bottles, laptop decals and iron-on designs. Walk-ins are invited between 3 p.m. and 5 p.m. to get a run-through and make Dooley memorabilia to take with you. For Marble Mug customization, customize a mug with a simple hydro-dipping technique. Drop in between 2:30 p.m. and 4:30 p.m. on Friday, Oct. 19, to learn how to do basic hydro-dipping, a painting technique that can be applied to many other methods of manufacturing and product design. Homecoming means a variety of reunions, learning opportunities and fun activities for Emory alumni, scheduled for Wednesday, Oct. 17, through Sunday, Oct. 21. Register here for Homecoming and Reunion Weekend 2018. All of the following events require registration through this link except for those noted. Here is a sampling of events. View the full schedule. All Nell Hodgson Woodruff School of Nursing alumni, students, faculty and staff are invited to hear the rich history of the school and to Nell’s Birthday Celebration on Wednesday, Oct. 17. Coca-Cola refreshments, pizza and cake will be provided in the plaza with after the presentation to be held in the School of Nursing auditorium. For more information, contact Megan Lennox. Alumni who graduated 50 years or more ago are invited to a brunch on Thursday, Oct. 18, at 10:30 a.m. themed “Emory Then and Now.” Emory President Claire E. Sterk will give opening remarks and Marshall Duke, Emory’s College of Arts and Sciences, will share his unique perspective of Emory over the last 50 years. This event will be in the Governor's Hall of the Miller Ward Alumni House and is $20 per person. Contact Michele Obester for more information. Emory Jazz Ensembles perform at 6 p.m. Oct. 18 on Patterson Green. Jazz on the Green is no charge, no ticket and no registration. This event is open to the public. The Graduate and Professional School Alumni Tailgate is being held Oct. 18 at SweetWater Brewing Company for alumni from the School of Medicine, Rollins School of Public Health, Nell Hodgson Woodruff School of Nursing, Candler School of Theology and the Laney Graduate School to reconnect and reminisce. Cost is $15 per person. For more information, contact Jessica Stephens. Friday, Oct. 19, offers a variety of learning opportunities and networking and reconnecting along with some beautiful music. Goizueta Business School has its “Back to School Academic Sessions” from 8 a.m. to 1 p.m. featuring classroom sessions with favorite professors and an update from Dean Erika H. James on Goizueta Beyond. The event is $20 per person and includes breakfast and lunch. Contact Stephanie Block for more information. Take a mid-day break with the Emory Chamber Music Society of Atlanta noon concert at Ackerman Hall in the Michael C. Carlos Museum. Virtuoso pianist Momoro Ono will perform a free concert. This event does not require registration. Laney Graduate School Network Exchange is also at noon, inviting alumni and current Laney Graduate School students for networking over a light lunch. Alumni are invited to share career pathways with students then answer their questions in a casual setting. This event is only open to LGS alumni and will be in the Psychology and Interdisciplinary Sciences (PAIS) lobby. There is no charge for the event. For more information, contact Jessica Stephens. At 1 p.m. participate in a class and panel discussion featuring Emory Nursing alumni leaders with “The Journey to Nursing Leadership Alumni Panel.” This will be held in the Nell Hodgson Woodruff School of Nursing Auditorium. There is no charge. Contact: Megan Lennox for more information. At 3:15 p.m. on Friday, join a historical walking tour of campus with Emory University Historian Gary Hauk. The free tour begins at the Cox Hall Clock Tour. Register here. Emory President Claire E. Sterk hosts "One Emory, Many Voices," a town hall discussion at 4:30 p.m. at Cox Hall. There is no charge, but attendees are encouraged to register. Saturday includes a full slate of events as well, highlighted by the Homecoming Parade at 1:30 p.m. and the Homecoming Festival and concert with Keri Wilson starting at 2 p.m.
Events wind down on Sunday with worship services, a free 4 p.m. concert by the Emory Wind Ensemble at the Schwartz Center for Performing Arts and a free 4 p.m. jazz family concert with the Gary Motley Trio at the Carlos Museum.